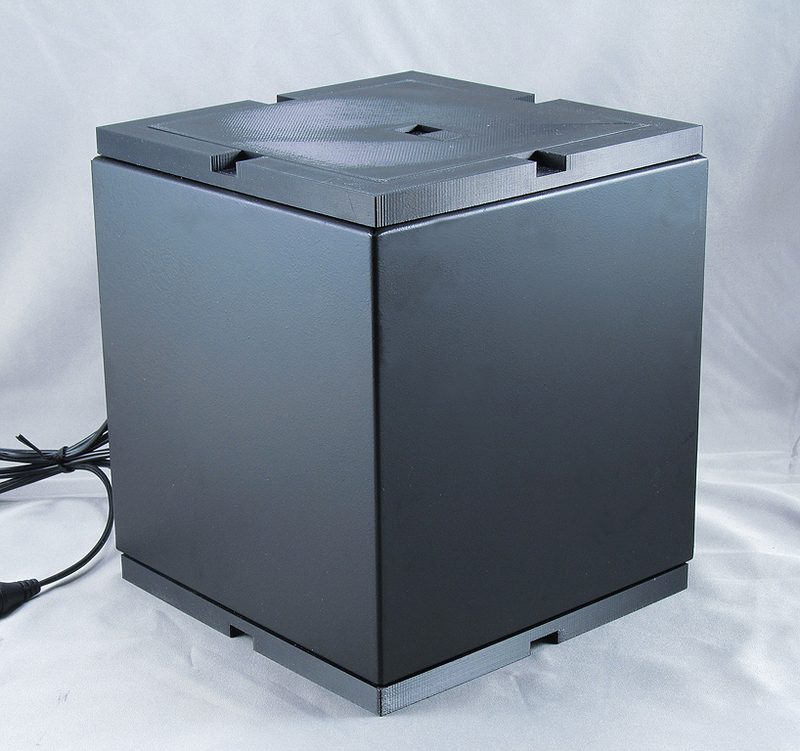 The Cure Cube is used for curing SLA 3D Prints created on the Form Labs 1+ printer. 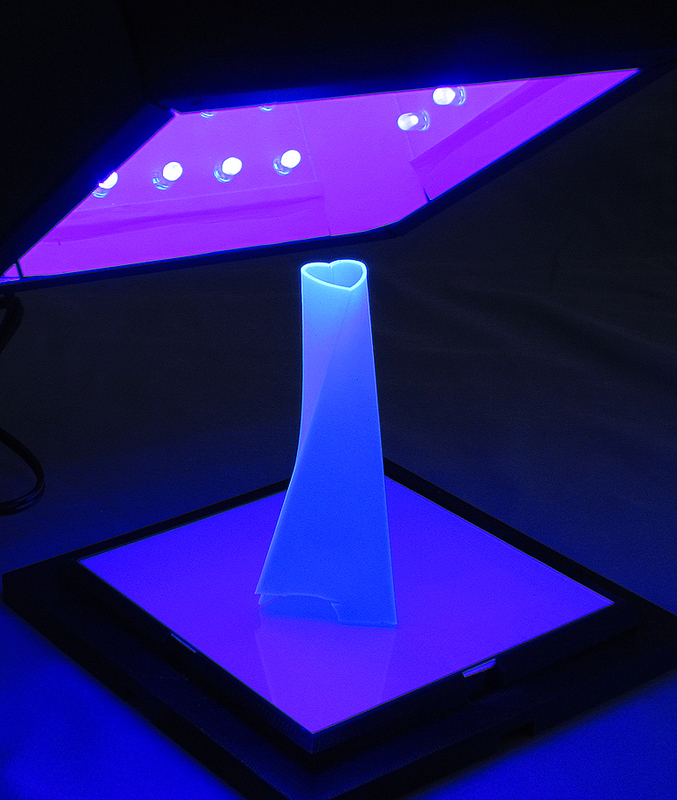 Exposing SLA prints to 405nm “UV” light increases strength and creates a harder surface for final finishing. While not particularly visible to everyone in the SSL universe, over the past few years one area of interest in LED product development for me has been in use of 405nm LED light sources to cure various plastics materials. The advantages are lower power requirements and reduced overall heat in the cure zone over conventional fluorescent or HID light sources. This has been of particular interest in curing fiberglass resins manufactured by Sunrez. The typical demand is for between 200 and 1,000 µW/CM² at 400-405nm wavelength. The use of LEDs allows us to generate exactly that without the waste of visible light, and longer wavelength power the resins are not reacting to. In one project, we were able to replace a 1,500W HID light source with a 120W LED light system that produced faster cure times with less than 10% of the total power, and virtually no heat added to the heat generated by the resin’s exothermic reaction to the curing initiator. 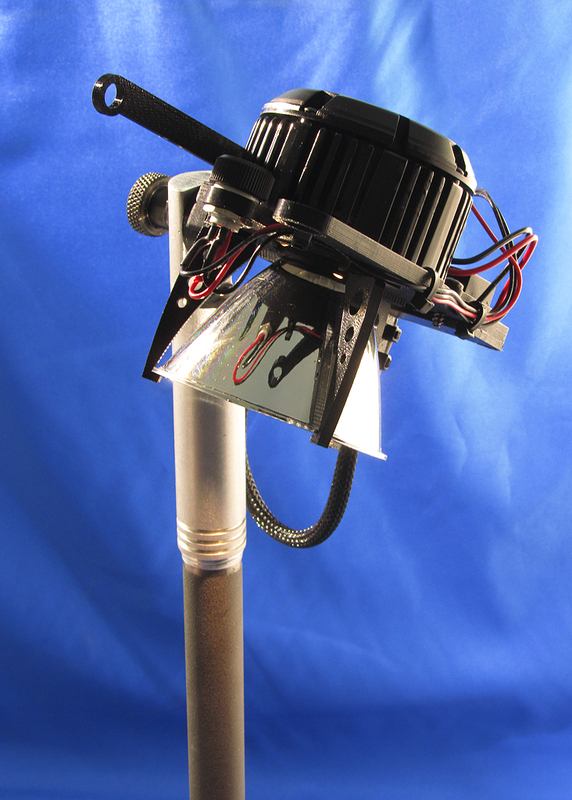 Since then, we’ve built 405nm light cure fixtures ranging from 1,200W to 25W. In this case, I needed to cure 3D prints we generate on a Form Labs 1+ 3D SLA printer, and do so in an office environment without exposing other materials and occupants to UVA light output. The material used in the print process is acrylic based, with chemistry that is photo-reactive to 405nm. The actual prints are made using a UV laser source. When the part is removed from the printer it is washed in alcohol (91% IPA), rested for a few hours to dry the alcohol off, then placed in this cure cube for an hour or more, depending on the thickness of the final component. The end result is a hard first surface for finish sanding or painting, if necessary, and a more rigid part as a whole (less flexible). The cube is simple, with vent reliefs top and bottom to encourage ariflow. The flush switch on the top cover was created using 3D printing processes for the slider and body, as well as top and bottom cover. The cube utilizes a simple aluminum housing, with FDM 3D printed top and bottom covers. The top cover houses a single Recom 500mA driver, slide switch and wiring terminal block on a Tasca LED driver circuit board. 5mm 450nm LEDs with a FWHM distribution of 60º, 25 per side and top (125 total), operating at 20mA each, mounted to custom circuit boards sourced at Express PCB. Each board connects the LEDs in parallel, while the boards are connected in series, resulting in a 500mA, 15.4V circuit, totaling 7.7W. The boards and internal exposed surfaces inside the box were then covered with White Optics 98 matte material to increase total light energy and diffuse The light energy at 405nm is roughly 600 µW/CM². The bottom surface includes a glass plate where the product sits in order to make any possible stickiness of a part from adhering to the White Optic material below. The interior of the cube is covered with White Optics 98 material for optimizing light energy re-cycling. The housing was powder coated matte black polyester to make clean up easy and the box look nice. The overall interior dimensions of the box are 1″ larger than the total build volume capacity of the printer itself (5 x 5 x 6.5), as any over-sizing is unnecessary. 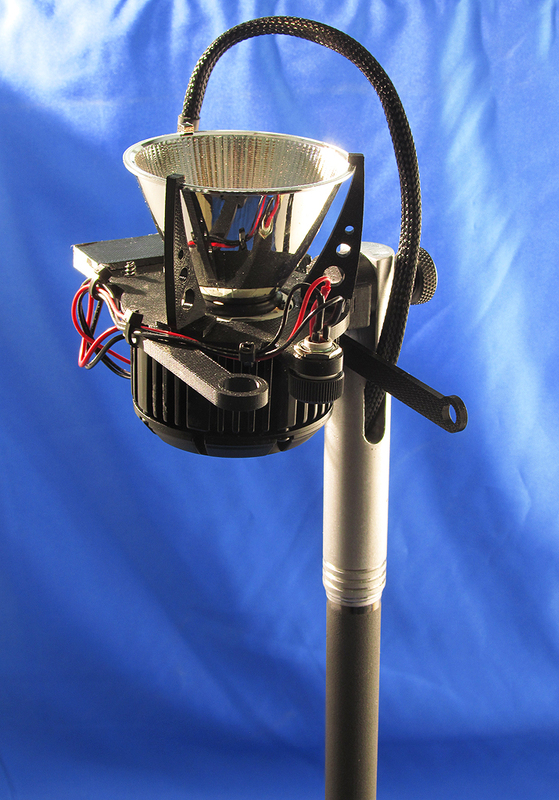 This produces an optimal match between the location of the LED sources and any part the printer can produce. 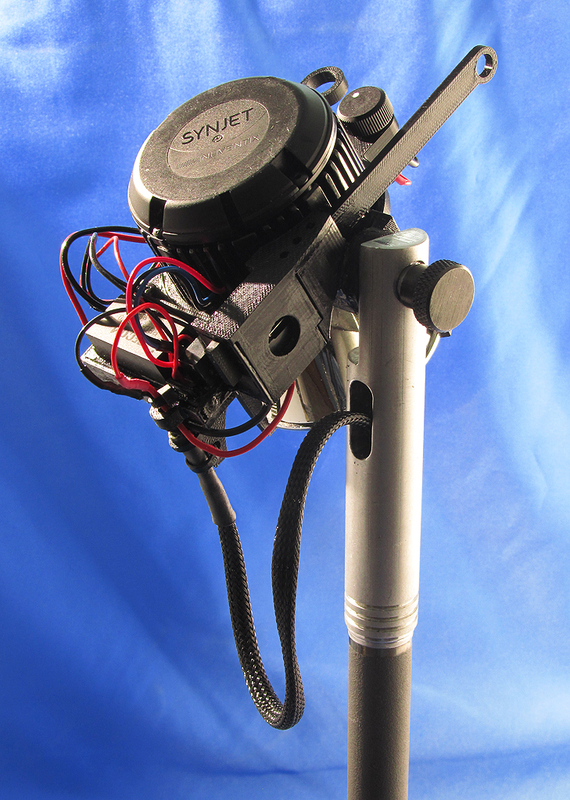 The Cube is powered by a remote plug mounted 24VDC power converter. The operation of the box is simple enough. The box is lifted up, the part is set on the base, the box is set over the part, and the light is turned on by sliding the switch to the on position. Simple and compact is the order of desktop manufacturing, and this fits that model perfectly. A look into the box lighted up and ready to accept parts. Testing so far has shown the cube can cure raw resin from liquid to fully hardened in less than an hour, and strengthens prints in that time or less. The heat generated from this arrangement is so small, there is no chance of any part being warped or affected by the process, other than the desired results of becoming stronger. For parts to be left unfinished, that are desired to be used over extended periods, we coat the finished parts in either acrylic or polyurethane UV inhibiting clear coat, gloss or matte. 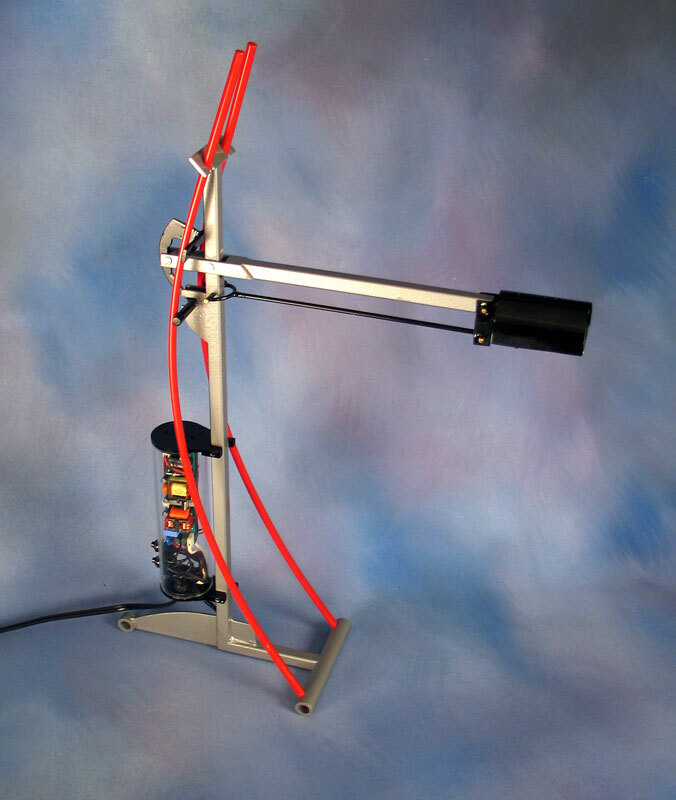 This stops ambient room light or daylight exposure from making the parts brittle over time. 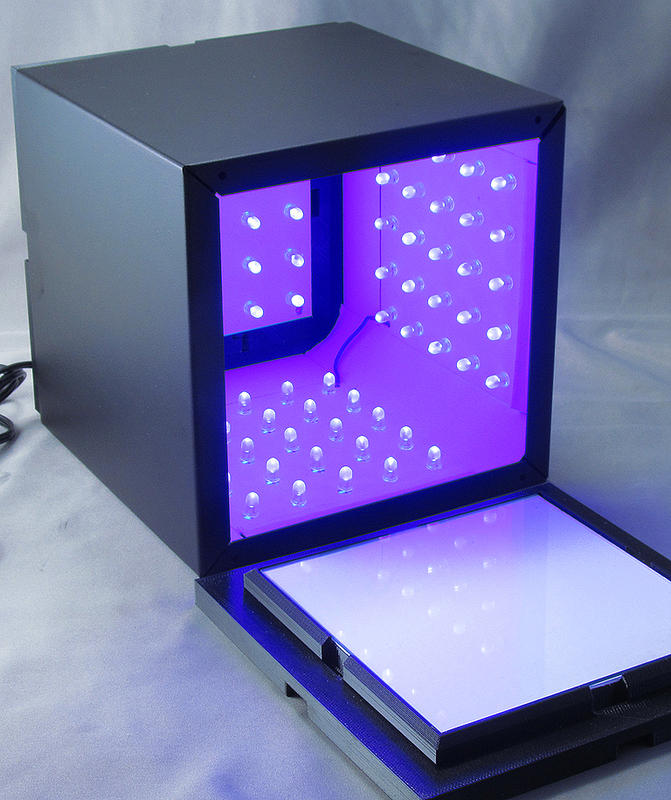 I am building a second copy of this cube for completing extended testing of samples of the materials we are using to verify clear coat effectiveness, behavior of the print material over long exposure periods, and the behavior of these low cost LEDs over time. A commercial version of this cube could be made using more robust LEDs, but the costs would be significantly higher as well. In the current configuration, the LEDs only cost $0.60 each, so should they last a couple of years in use, replacement of the populated boards is a simple task, while the cost of higher power LEDs would have increased the cost of the entire end-product by as much as three times. There is also an additional version of this same approach in using Red/Blue light sources for use in plant seedling starts. We’ve found tests with common rye and barley grasses, the time from germination to hearty growth ready for planting is accelerated significantly. Using an enclosure like this allows the plants to be exposed to intense light for extended periods of time (18 hours or more) without polluting the surrounding environment with the ugly light, just as the enclosed cube protects room occupants from exposure the the UVA light. 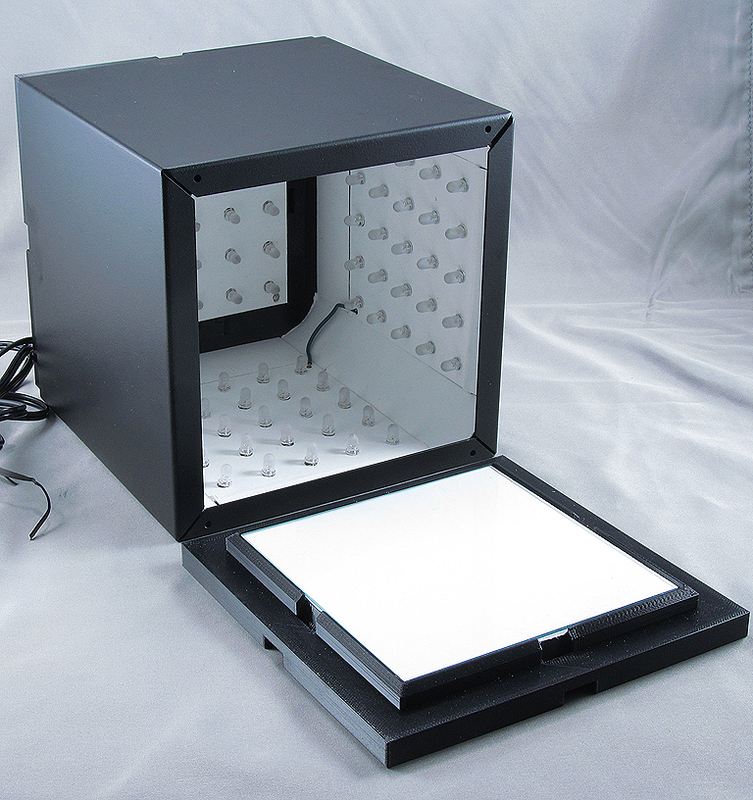 In either case, the cube can be used in any room environment comfortably and safely. So this gets us off the ground and is D1 of 52 in the series. As I’ve noted at the start, this is an exercise in making progress, and putting SSL to work. This is not a particularly exciting product in and of itself, but it is one that will be used regularly, which more than makes up for its lack of marketing sizzle for the masses – at least in my book. This fixture is my very first LED light. 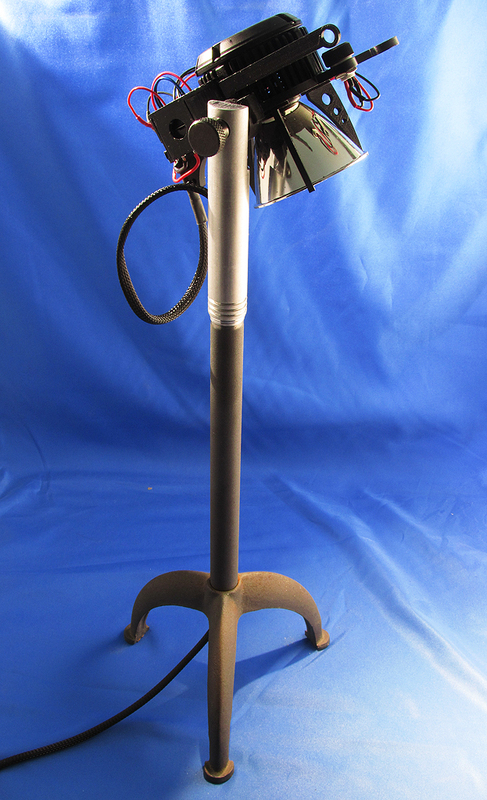 It started life to be a halogen fixture in 2004, that sat on a workbench waiting completion. 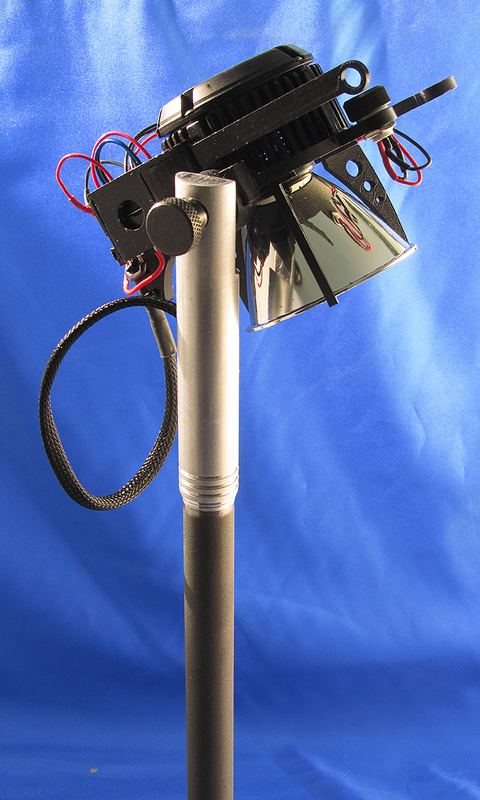 The first head got so hot from the 50W 12V light source, it was dangerous, so it sat as I decided what to do with it. In 2005, as LEDs became viable for lighting, I pondered using them to replace the halogen source, but they delivered so little light, the end product was useless as a desk lamp, so it sat some more. One idea was to insert a Lamina BL3000 LED into the head, but the driver was huge, the light output too little, and the heat still an issue. Then, in early 2006, while at Visa Lighting, Don Brandt (an engineer working with me at Visa, formerly from Emteq, now working at Cree I believe) were talking through ways of applying the latest mid-power LEDs using a simple PCB. We decided to give it a shot and built a board populated by a vendor with 8 Nichia LEDs. The inspiration struck to power these LEDs with two Xitanium drivers, which at the time were un-potted prototypes, so cutting them out of their housing to be installed in clear tubes to show their interiors off was easy enough. Two push-button switches activated the drivers for a high-low effect, and a heat sink was made up of a machined aluminum block installed in the head where the original halogen lamp and reflector once lived. More details and images of this can be found on the Lumenique archives for the Ratchet fixture. The fixture itself is made of welded steel structure with a brass head and fiberglass tension springs. The head can be raised an lowered with a ratcheting action, staying level at any height. In the end, I left this fixture with the owner of the Oldenburg Group (owner of Visa Lighting) as a parting gift as I moved on to focus on Lumenique and SSL exclusively.